WELLSTON, Ohio — Getting a good look at the start —and even the finish. 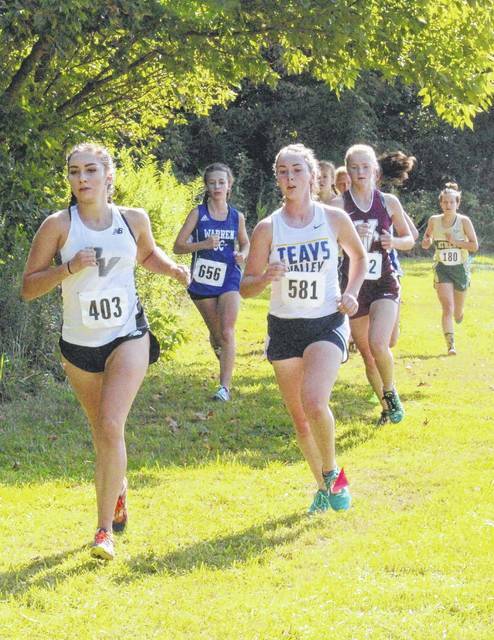 Five cross country teams from the Ohio Valley Publishing area, all of which are members of the Tri-Valley Conference, competed on Saturday morning in the annual Wellston Golden Rocket Invitational —held on the campus of Wellston High School. The River Valley Raiders, Eastern Eagles, Meigs Marauders, Southern Tornadoes and South Gallia Rebels all got an early run on the Wellston cross country course —for that is the site of this season’s TVC championship meet. Leading the way were the River Valley boys and Eastern girls, which placed third and fourth respectively in the team standings. For the girls, the Lady Eagles amounted 102 points for fourth — trailing only champion Athens (39), runner-up Teays Valley (54) and third-place Vinton County (88). River Valley finished sixth with 185 points, trailing Warren by 55 points (130) for fifth. Meigs (259) and Southern (272) were ninth and 10th respectively, as Jackson (217) was seventh and North Adams (258) eighth. Rounding out the team scores were Huntington (283), Portsmouth Clay (293), Symmes Valley (408) and Southeastern (416). The Lady Eagles enjoyed taking two top-10 spots, along with three in the top 23, six in the top 42, and all seven of their counting scores in the top half of the 143-runner field. Eastern senior Jessica Cook, who qualified individually for the Division III state meet last season, finished fifth overall with a time of 20 minutes and 57 seconds. The Eagles’ Ally Durst took 10th in 21:21, while Rhiannon Morris was 23rd in 22:32. Kaitlyn Hawk (38th in 23:46), Whitney Durst (39th in 23:51) and Lexa Hayes (42nd in 24:16) were within 30 seconds of each other, while Hannah Hill had Eastern’s final counting score in 67th-place in 25:54. River Valley was paced by senior Kenzie Baker, who crossed 14th overall in 21 minutes and 40 seconds. Hannah Culpepper, a freshman, placed 35th in 23:38 — as Akari Michimukai, a foreign-exchange student from Japan, made it across the line in 53rd in 24:54. The remaining Lady Raider scorers included Josie Jones (56th in 25:11), Julia Nutter (80th in 27:46), Lexi Stout (104th in 30:36) and Connie Stewart (105th in 30:53). For Meigs, Taylor Swartz (55th in 25:06) and Caitlyn Rest (57th in 25:14) were first across, followed by Madison Cremeans (68th in 25:56), Carmen Doherty (78th in 27:35), Ariann Sizemore (91st in 28:34), Kacie Ballard (93rd in 28:41) and Katilyn Brinker (113th in 31:30). Southern sophomore Sydney Roush paced the Lady Tornadoes, crossing in 22 minutes and 28 seconds to place 22nd. Four other Tornadoes competed —Mallory Johnson (58th in 25:15), Madison Lisle (87th in 28:16), Kathryn Matson (99nd in 29:36) and Addie Matson (118th in 32:15) — while South Gallia did not have any runners take part. Athens senior Rebekah Shoup captured the individual championship, completing the 5K course in 20 minutes and two seconds. For the boys, River Valley and Meigs fielded full squads —with the Raiders placing third with 99 points, and trailing only champion Teays Valley (41) and runner-up Athens (67). The Marauders placed 10th with 270 points, as there were also 14 total boys clubs which scored. 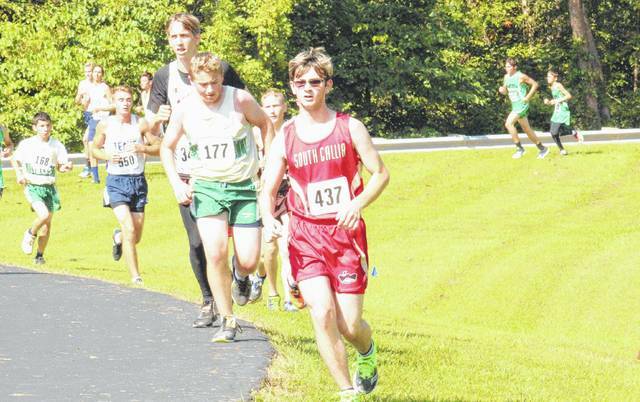 Eastern, Southern and South Gallia sported two runners apiece. River Valley senior Nathaniel Abbott, a Division II regional meet qualifier from a year ago, led the Raiders by finishing fifth in 17 minutes and 31 seconds. The Raiders had four scorers inside the top 35, and all seven within the top 60. George Rickett (20th in 18:39) and Rory Twyman (22nd in 18:44) crossed within five seconds of each other, followed shortly thereafter by Austin Livingston (34th in 19:19), Kyle Coen (41st in 19:37), Caleb McKnight (54th in 20:12) and Cole Franklin (59th in 20:16). Meigs junior Cole Betzing paced the Marauders, placing 16th in 18:27. The other Marauder scorers were Brad Logan (70th in 20:47), Landon Davis (79th in 21:04), Colton Heater (105th in 22:21), Tucker Smith (114th in 22:56), Joseph Cotterill (120th in 23:19) and Christian Jones (130th in 24:04). Eastern’s only runners —Owen Arix and Colton Reynolds —finished back-to-back in 10th and 11th in 18:04, while Southern’s senior tandem —Conner Wolfe (18:54) and Larry Dunn (18:58) — crossed back-to-back in 26th and 27th. The Rebels’ only individuals were freshmen Garrett Frazee (40th in 19:36) and Griffin Davis (141st in 24:50). There were 181 runners in the boys high school race, which was swept by the Athens duo of Peter Buckley (1st in 16:37) and Tony Tonkovich (2nd in 16:46). South Gallia’s Griffin Davis competes in the boys high school race as part of Saturday’s annual Wellston Cross Country Invitational at Wellston High School. River Valley’s Kenzie Baker competes in the girls high school race as part of Saturday’s annual Wellston Cross Country Invitational at Wellston High School.